If you’re new to my project, Chasing the Dragon, you may want to read an introduction here. I need your input on my first house rule. Now this may surprise you, as I’ve never even played a session of AD&D yet. Not as a GM. Not as a player. Never. Now I’ve played 4e extensively and the 5e playtest. I’ve played the FFG Star Wars RPG extensively, as well as FIASCO, Pathfinder, and the Mouse Guard RPG. I’ve played an RPG or two, but I’m certainly no expert. So please answer my question, oh experienced grognards of the first edition! Is the following rule going to work well, while keeping the spirit of the game in tact? Well, the reason is simple. The initiative rules don’t make any freaking sense. They seem to at first–“Roll a d6 for each party at the beginning of each round? No problem!” But it’s not that simple. Ooooh, no. You see, that doesn’t really apply to magic-users. And then characters with multiple attacks are all screwy. Beyond that, you can see a list of all the complications here. In the end, OSRIC (a reprinting and streamlining of the AD&D rules) basically made up their own initiative system that (1) seems loosely based on how initiative works for magic-users and (2) ignores weapon speed altogether. If OSRIC thinks there’s a problem with the initiative system, there’s probably a problem. What is weapon speed, the uninitiated ask? Basically, it’s a rating given to weapons to tell how quickly a person is able to strike with it. There’s no precise timing given to each rating, but a fist (1) is faster than a dagger (2) is faster than a broadsword (5). The way the weapon speed is applied relates to initiative, but is generally convoluted and too confusing for anyone to actually use on the fly. Xd6 are rolled, X representing the number of parties participating in the conflict. It helps if dice are differently colored to denote various parties. Parties with lower dice scores may act earlier in combat. 2d6 are rolled. The heroes’ die equals 2. The enemy’s die equals 6. The heroes will go earlier in combat, because their die is lower. The party with the lowest-scoring die may begin acting in the first segment of combat. The heroes may begin acting in the first segment of combat, because their die roll is lowest. The enemy may not begin acting until the fifth round, after four rounds have passed. This is because the difference between 6 and 2 is four. In the same fashion as casting speed, weapon speed indicates the number of segments necessary to complete an attack. If the enemy, starting its turn in the fifth segment, seeks to attack a hero with a footman’s mace (speed factor 7), the attack will not be completed until the end of the eleventh segment (meaning the first segment of the next round). Characters may charge 1 hex per segment with their attack occurring in the following segment. Players may not charge more than their maximum speed. Charges do not take weapon speed into account. I think this will not only clarify the rules in a way that retains weapon speed, I think it will play smoothly. Not to mention, it may give early level magic users a little bit of protection by delaying some of those weapons. Regardless, what do I know? I’ve never played before! I need your help, so please RT and pass this around. I want as much feedback as I can get. Tweet me at @wood_jasond or sound off in the comments below! #3 Compare raw dice results. Great input, man. What feels complicated? Focusing so much on segments? Definitely, your segment rules have a lot of conditional modifiers that just complicate the initiative sequence more than needed in my opinion. We did something similar. Each player and villain rolled a D6 and the results were compared. We only used Weapon Speed/Dex in the result of a tie for the same Initiative on D6. Yeah, we pretty much rolled d6’s unadjusted, and ran with those scores. When 2e came out, we borrowed its initiative rules. That was, d10s, plus weapon speed or spell speed (for spells, spell speed = no. of segments to cast, so a fireball would have a speed of 3), lower scores go first. Ties resolved in favour of those with lower spell/weapon speed. I think we may have also used the dexterity reaction adjustment as a modifier. I always hated weapon speeds, though, because they did not take into account the advantage of reach. Your dagger may be faster, but you have to get past my sword to get close enough to stab me. 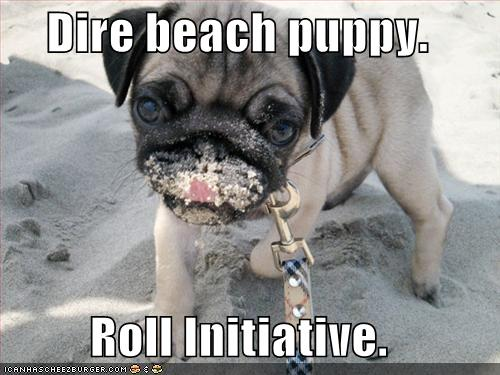 We never did use the initiative rules that I proposed above. We tried our best to run RAW. However, as we start the Secret of Saltmarsh soon, we’re considering something similar to what you suggest…though it does take weapon speed into consideration. More on that soon!! The system I use is like this: Combat Round is 10 seconds/segments (I came from Basic to AD&D in the 80s and carried over a more tactical approach to combat than the 1-minute round implies). Monsters roll a d10, each member of the party rolls a d10. Apply Dex bonus. This indicates how many seconds/segments they get to use (yes, especially fleet characters can have “13 seconds/segments” of a 10-second round to reflect their awesomeness). You can have the players apply weapon speed if you want, subtracting it directly from their initiative, or skip it. Multiple attacks per round happen based on subtracting weapon speed from initiative. You need to decide what weapon speeds ranged weapons have if you go this route. Spells start on the initiative roll segment and fire off the number of segments (seconds) later indicated in the spell description (and can be interrupted in that window). You can choose whether to have all actions that happen at zero or less go simultaneously or continue to rank order them into the negative numbers. Characters with high initiative can wait and attack when they wish. Movement is dex feet per segment. This makes combat into a bit of a war game and yes you do need grid sheet and figures/markers, but it is very clear what the situation is and who goes when. And as I look again at the other responses it looks like we house ruled the 2e d10 initiative system. Now that I’ve been playing AD&D for about a year, I can see that my original idea was pretty overcomplicated. But I continue to brainstorm different ways to do it. How was it done in 2e? I have to admit, I don’t remember perfectly. I played weekly for about 2 years under 2e, when our DM transitioned from 1e. The initiative system that I described was what we used, and I have to say that I preferred it to the 1e initiative system, remembering it and using it now that I am chasing the dragon with my kids. Whether it was the 2e system or not, I cannot say–our DM was an old hand who would have thought nothing of house-ruling it if it suited him. I’ll take Beoric at his word above, and it looks like a pretty reasonable system. You’d only need to reverse the dex bonus to reaction and you’d have a pretty simple, workable system.